This is our Math Dictionary words that start with T page. There is a mix of hard to imagine words here and super simple words like triangle. Math Words That Start With T: See a printable Math Dictionary below. Table - a way of organizing data in columns and rows. Tally Mark - a small mark used to help keep track of a count. Tangent - a line that meets a smooth curve at a single point and does not cut across the curve. Tangent - the secant of an angle is the ratio of the opposite side to the adjacent side. Tangent Line - a line that intersects a circle or graph in just one local point. Tautology - a sentence that is true because of its logical structure. Tens column - the second column of numbers to the left of the decimal point. Terms - individual numbers in a mathmatical operation or equation. Like terms use the same letters 5ab and 8ab. Unlike terms use different letters 7xy and 9yz. Tessellation - a repeated geometric design that covers a plane without gaps or overlaps. Tetrahedron - a three dimensional geometric figure (a polyhedron) that is made up of 4 equilateral triangles. Tetromino - a four-square polyomino. Theorem - a mathematical statement that has been proven to be true. Theoretical Probability - the chances of events happening as determined by calculating results that would occur under ideal circumstances. Theories of Probability - a theory of probability is a way of understanding probability statements. That is, a theory of probability connects the mathematics of probability, which is the set of consequences of the axioms of probability, with the real world of observation and experiment. Toeplitz Matrix - a matrix in which all the elements are the same along any diagonal that slopes from northwest to southeast. Tolerance - the amount of error accepted in a given situation. Torus - a geometric solid in the shape of a donut. Total - sum, or the overall sum of numbers, or quantities, of many equations. Trace - the trace of a matrix is the sum of the terms along the principal diagonal. Transcendental Number - a number that is not algebraic. Translate - In a tessellation, to translate an object means repeating it by sliding it over a certain distance in a certain direction. Transversal - a line or ray that divides other lines or rays. Trapezium - a quadrilateral in which no sides are parallel. Trapezoid - a quadrilateral with exactly one pair of parallel sides. Triangle - a geometric figure with three sides. Triangular Number - a number of the form n(n+1)/2. Trigonometry - the study of the geometry of triangles. Trinomial - an algebraic expression consisting of 3 terms; a polynomial with three terms. Tromino - a three-square polyomino. Truncated Cube - created by truncating the tips of the cube one third of the way into each edge. Truncated Cuboctahedron - created by truncating (cutting off) the cuboctahedron one third of the way into each side. Truncated Dodecahedron - created by truncating (cutting off) the tips of the dodecahedron one third of the way into each edge. Truncated Icosahedron - created by truncating (cutting off) the tips of the icosahedron one third of the way into each edge. Truncated Icosidodecahedron - created by truncating (cutting off) the icosidodecahedron one third of the way into each side. Truncated Octahedron - created by truncating (cutting off) the tips of the octahedron one third of the way into each edge. Truncated Pyramid - a section of a pyramid between its base and a plane parallel to the base. Truncated Tetrahedron - created by truncating (cutting off) the tips of the tetrahedron one third of the way into each edge. Twin Primes - two prime numbers that differ by 2. For example, 11 and 13 are twin primes. I know this about Math and Science, if your students understand the basic prefixes, roots, and suffixes; they'll be able to discern the meaning of more terms. For instance the suffix tri-. Almost any word that begins with this suffix means that there are three of what the root word indicates. A triangle has three angles, a tricycle has three wheels, etc. I went all the way through two degrees not seeing truncated cuboctahedrons (what are these doing in children's Math books?! ), but at a glance I know that the word truncated means that something is cut and I can see the octa meaning eight and I'll bet that I could have gotten a multiple choice test question right just knowing these definitions. 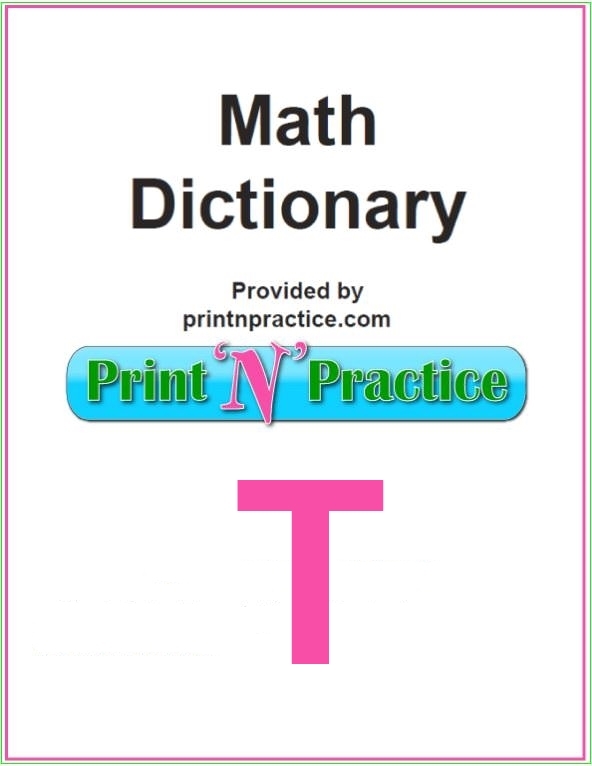 Thank you for visiting my words that start with T.
I print and keep these Math definitions as a glossary in my binder: Free Printable Math Dictionary For Kids. You can also download it to your tablet or bookmark the page. 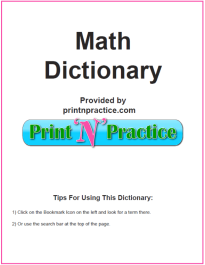 See the alphabetical links below for more online Math words. 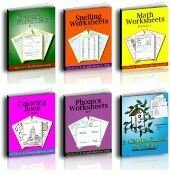 Buy Our Math Worksheets Bundle And Save Time! Sample Math practice worksheets. Bundle includes dictionary for Math. 2. One PDF Download. No ads. 5. Use with any Math Lesson Plans. 6. Addition, Subtraction, Multiplication, Division and Fraction Practice. 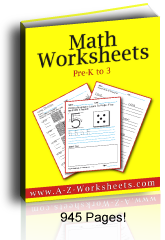 Check out our main printable Math worksheets page. Check your answer with this Math problem solver.